I’ll never forget taking an elevator down in the arts deco Fuller building at Madison and E. 57th Street. It stopped. In walked Diana Ross. She was . . . more beautiful than I’ve ever seen her. Taller than I expected, too. We chatted, alone. I knew I’d never forget how beautiful and graceful she was. Never have. Remember too, when on a NYNY street, there was Mike Tyson striding down the sidewalk, with a comely blonde on each arm. Mike! With thousands of Bergamot blooms fresh and pumping nectar, I knew that butterflies would come, to join the bees, flies, moths and hummingbirds who already were at work, imbibing sugary nectar. 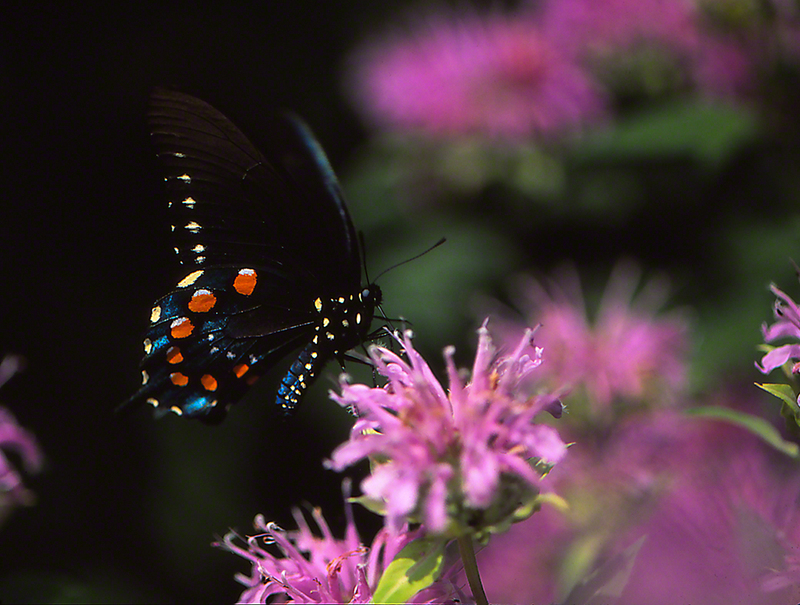 Sure enough, in swooped a large, black butterfly, straight to the Bergamot. 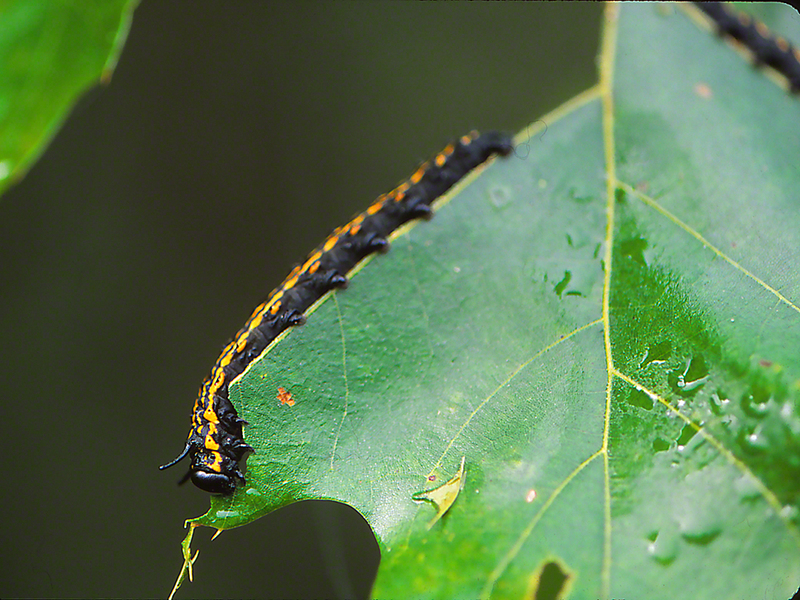 Here’s our Pipeline Swallowtail, beaming out its oranges, iridescent blues, and white, all on a starkly black background. Diana, Mike, Virginia and Pipevine, all in the same league: The big leagues. These last 3.5 years seem to have shot by, in a flash. wingedbeauty.com has been up that long, and now archives the more than 430 images that we’ve posted. I shoveled snow twice today, and I must have looked forlornly at my front garden at least 8 times. The American plums and ice hydrangeas are only in for one year, but they gamely stood in their beds, buds looking healthy and earnest. Back in the house, I got to thinking. Which of all of my posted images has stood out amongst the others, for this or that reason? Here is an answer to that. This image is the most shared of them all. 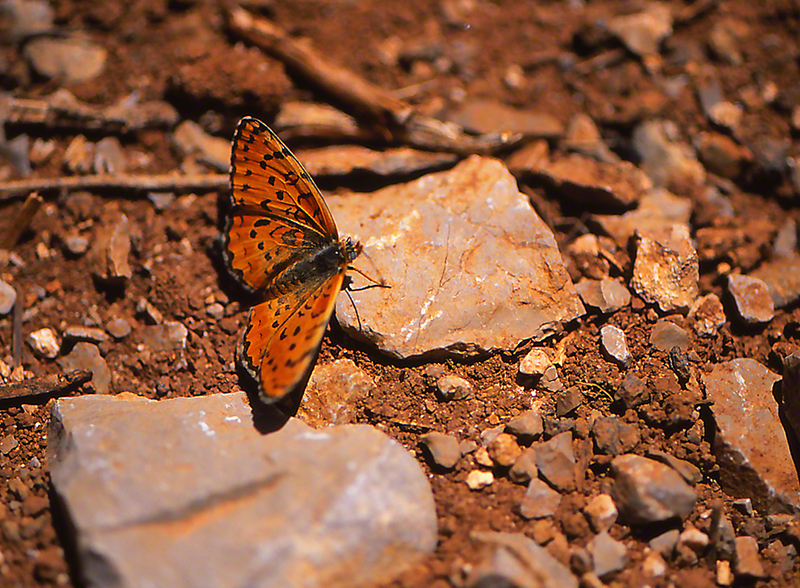 it’s serendipity too, because we met this Melitaea Persea Montium butterfly on the tippy top of Mt. Hermon, in Israel in June 2008. It was very, very hot and dry on that mountain, and I like remembering that now, when the last 2 weeks have featured nights with zero degrees Fahrenheit and below. Why is it the most shared? I must guess. Because it is very rare, only found on that mountain top, and its flight is short, happily in June, when Mr. Passion for Seeking Butterflies was on the top of the mountain. I fly to Israel on March 8, G-d willing. No way I can work Mt. Hermon for butterflies. It is covered with a cap of snow. I do plan to explore the slopes of the mountain, and the Upper Galilee. Yes I will be careful. Knowing that I’ll be close to the border with Lebanon, where the terrorist organization Hezbollah has now been joined by Iranian troops, together conspiring to cause murder and mayhem, this once-Brooklyn boy has seen enough action to not want to . . .
You know, the United Nations should have a permanent representative with a vote, there to represent all of G-d’s creatures, who seem forever jeopardized by the senseless actions of crazy humans.